The assassination of Yitzhak Rabin on 4 November 1992 shocked the world. Showing in competition at the 72nd Venice Film Festival, Amos Gitai’s Rabin, The Last Day (2015) is an earnest, forensic examination into the slaying of the Israeli Prime Minister. It was a moment when political murder struck at the heart of a country which still proudly contends that it is the only functioning democracy in the Middle East. Following an opening interview with then Defence Minister Shimon Perez, Gitai moves from stock footage of the peace demonstration, called to shore up support for the unpopular Oslo peace accords, to a moment of dramatic reconstruction as the shots are fired. Pure panic is the first response as security guards bundle the wounded PM into his car and tear off to the hospital. 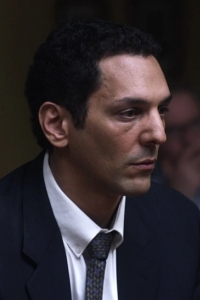 Following this kinetic scene, Gitai calms everything down to the pace of due process as an inquest is called to investigate the failings of the police and secret service that led to the hit. This is what was to be known as the Shamgar Commission, led by President of the Supreme Court Meir Shamgar (Michael Warshaviak), who was assisted by Zvi Zamir (Yitzhak Hiskiya) and Ariel Rosen-Zvi (Pini Mittelman). There’s a sense of theatricality as enquirers interview the cameraman who shot the footage, with characters pacing back and forth from the foreground meditating deeply. As the inquiry gets properly underway artifice is abandoned for a more clinical record of words spoken, questions asked and the remit of the committee being restricted so as to forestall a broader political discussion. Interspersed throughout Rabin, The Last Day are scenes involving those that Gitai obviously feels to have blood on their hands, the fanatical and religiously orthodox settlers, who cast an ancient curse on Rabin – Din Rodef (Law of the Pursuer), effectively a Fatwah – and attend demonstrations which invoke such violent language as to be tantamount, according to Perez, to sedition. There are moments of almost black humour, as when a psychologist gives a lecture to a right wing group about how she has diagnosed Rabin as schizophrenic. “A schizophrenic is someone who lives in an imaginary world,” she says, blithely unaware as she bursts into tears that this description could also apply to the right-wing Jewish group to which she belongs. The murderer himself, Yigal Amir (Yogev Yefet), is interviewed by an elderly investigator who cannot hide his contempt. When Amir claims to have acted on behalf of the dues, his inquisitor replies, “Did you ask the Jews if they wanted this?” The film increasingly becomes an investigation on the risk to Israeli democracy posed by fanatical groups. However, Rabin, The Last Day’s broader political context is seen as being beyond the remit of the commission. The security failures are seen as manifest with an appalling laxness considering the actual death threats and the general tone of hostility. Although there is the suggestion of a conspiracy, the likelihood seems to be that there was an inexcusable level of complacency. What happened that day on the Kings of Israel Square had the immediate effect of causing widespread grief and outrage. The square itself was renamed Rabin Square as were other streets and buildings. The religious community was also taken aback by the vehemence of condemnation that came their way and found some comfort in conspiracy theories that the whole thing was a set up to make them look bad. Some illegal settlements in the Occupied Territories were rolled back as we see both reenacted and through stock footage. However, as time has goes on Gitai clearly indicates that those responsible for violent rabble rousing – Benjamin Netanyahu chief among them – were ultimately the victors, seizing Israel’s future and turning it in an increasingly belligerent direction.